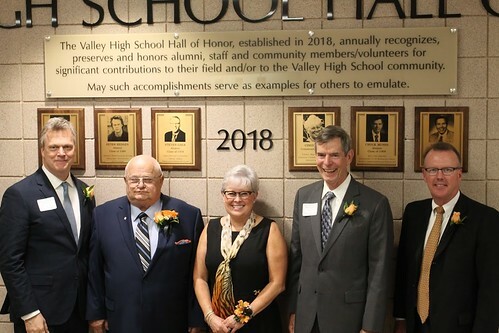 The Valley High School Hall of Honor was established to recognize outstanding alumni, educators, and community leaders who, through achievements, endeavors, leadership, and character, are positive role models for the student body of the West Des Moines Community Schools. These individuals have specifically dedicated their time and made significant contributions to the Valley High School community. Hall of Honor inductees are carefully selected by a committee of Valley High School and West Des Moines Community Schools staff and community members. Learn more about the selection process. Dr. Phil Carter was born in St. Louis, Missouri. His family moved to West Des Moines, Iowa, in 1955. He attended Valley High School, acting as co-captain of the football and basketball teams. He graduated in 1957 and went on to study medicine at the University of Iowa and Washington University (St. Louis) School of Medicine. He then served in the U.S. Air Force as a captain and general medical officer. After completing his service, Carter worked as a neurosurgeon and professor for several organizations including the Barrow Neurological Institute, the University of Oklahoma School of Medicine, and the University of Arizona College of Medicine. Carter patented two neurosurgical instruments, pioneered a joint study on tumor therapy, authored more than 100 articles and books on neurosurgery, and presented at numerous national and international neurosurgical conferences. Carter died in 2010 after a long and courageous battle with cancer. He is survived by his wife Colleen. West Des Moines Mayor Steve Gaer has served as West Des Moines Mayor since April 2007. He has also served West Des Moines as a member of several organizations and committees, including the West Des Moines Community Schools Foundation for Education Excellence, the West Des Moines Capital Improvement Committee, and the West Des Moines Development Corporation. He has been the chief operating officer and general counsel for R&R Realty Group in West Des Moines since 2004. A second-generation Valley High School graduate, Gaer was a State of Iowa Scholar, president of the National Honor Society, and a member of two state golf championship teams during his high school years. He also received the American Citizenship Award. After his graduation in 1979, Gaer earned degrees from the University of Kentucky and Drake University Law School. A lifetime resident of West Des Moines, Gaer is husband to Sally and father to Jacob and Margaret. Peter Hedges is an award-winning playwright, novelist, screenwriter, and film director who graduated from Valley High School in 1980. He studied drama at the North Carolina School of the Arts. Hedges rose to fame with his first novel, “What’s Eating Gilbert Grape,” which was adapted into a critically acclaimed movie. He has written two other novels and numerous plays and written and directed movies including “Dan in Real Life,” “Pieces of April,” and “About a Boy.” He received an Academy Award nomination for Best Adapted Screenplay for “About a Boy.” During his time at Valley, Hedges was heavily involved with Valley Drama as a member of the Thespian Club and the Baker’s Dozen mime troupe. He has returned to Valley to speak with students many times, performing with the Baker’s Dozen in 2010. Hedges is married to poet Susan Bruce. They have two children Simon and Lucas. Cindy Todd is a West Des Moines Community Schools parent who has been volunteering in the district for 27 years. Todd started volunteering when her daughter entered kindergarten at Fairmeadows Elementary in 1991. She is an active member and supporter of the WDMCS Student Scholarship Fund, co-founded the Valley Drama Booster Club, and was involved with the development of the Staplin Performing Arts Center. She has been part of several district committees and organizations that support the WDMCS including parent groups at Fairmeadows Elementary, Stilwell Junior High, and Valley/Valley Southwoods; the Staff Recognition Committee; School Community Network; three community PPEL committees; several district interview committees; and the WDMCS Foundation Board. Todd and her husband, Dan, reside in West Des Moines. Her daughter Megan graduated from Valley in 2004, and her son, Rob, graduated from Valley in 2008. Jim Underfer is a retired WDMCS teacher and wrestling coach who worked at Hillside Elementary, Stilwell Junior High School, Valley Southwoods Freshman High School, and Valley High School. As a teacher, he received the Environmental Science Teacher of the Year award and the Goodwill Recycling Teacher of the Year award. As a coach, he was recognized by the USA Olympic Committee and inducted into the National Wrestling Hall of Fame and the Iowa Wrestling Coaches Hall of Fame. Underfer also established the Valley High School Athletics Hall of Fame outside the Field House. He worked at Valley High School for 30 years, spending countless hours teaching and coaching students during and outside of school hours, often welcoming students into his home. He was married to Alice Underfer for 55 years and has three children and five grandchildren. His favorite memory from his time at Valley High School is the laughter of students.